Question: If you had to guess, how would you say I was doing lately at the gaming tables? All the poker books stress one thing: Do not get caught up in short-term results. Luck is a big factor in the short term, but over the long term, luck will even out and good play will prevail. So don't let a short run of bad results get to you, blah, blah, blah. To which I say: Uh-huh. 1. I wanted to feel like I earned it. Actually, there are a number of ways to get into the championship besides plunking down 10 grand. The easiest and quickest is to win a $1,030 buy-in one-table no-limit hold-'em satellite tournament (10 players pay the $1,030 and play until only one is still standing, or, more accurately, still sitting). You can enter a $1,030 buy-in no-limit super-satellite, in which the final 10 percent still alive at the end get "free" seats into the championship. You can enter one of the twice-daily $225 buy-in no-limit super-satellites, out of which, for every $10,000 in prize money, a "free" seat is awarded (the low cost of getting in via this tournament is a bit deceptive, since, for the first two hours of these tournaments, you can rebuy $500 worth of chips for $200 every time you go broke, and you can add $500 worth of chips -- for another $200 -- or $1,000 worth of chips -- for $400 more -- at the end of the rebuy period, so it's not uncommon to wind up spending close to $1,000 if you want to qualify for the championship via this "cheap" route). 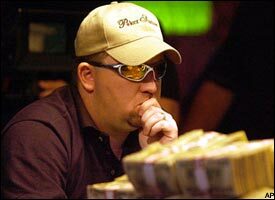 Chris Moneymaker earned a cool $2.5 million by winning last year's World Series of Poker. To make a long, sad story short, I tried them all -- except the internet tourneys -- with a noticeable lack of success. Got close a couple of times -- once when I finished 13th in a $225 buy-in super (they were giving out seven seats that night), and once when I finished about 90th in a $1,030 buy-in super (the top 43 finishers got "free" seats). The hard part about the latter failure for me was not so much missing out on the "free" seat, but the fact that it brought into sharp relief just how much I have to learn about this game just to get up to "okay" ... never mind "great," or even "good." As is usually the case in poker tournaments, the key hand was the last one. I was the big blind (for $800), and everybody else folded around to the small blind, who went all in for about $5,500. I had about $4,000 worth of chips, so if I called and lost, I was out. However, if I called, I would be getting about 3-2 pot odds (putting in $4,000 to win almost $10,000). Since I held K-Q suited, I figured to be about an 11-10 underdog to most hands the small blind was likely to have -- any underpair, which is to say, any pair Js or lower -- and a favorite to any hand the small blind was holding if this was an attempt to steal the blinds, which was possible. I wasn't worried about dominating pairs -- aces, Ks or Qs -- because I figured, with those hands, the small blind would have made a more modest bet -- maybe $1,500 or $2,000 -- in an attempt to keep me in. An all-in bet suggested the goal was to have me fold. The only possible hands to worry about were A-K or A-Q, which would have huge advantages over my K-Q. More important, I needed to gamble at that point, since $4,000 was about a third the bankroll of what the average player had left. If I folded, I had about enough money to get through one round -- blinds were going up to $600-1,200 on the next hand, plus we had to put in $200 antes on every hand. So there was a pretty good chance I'd never be in this good position again -- head-to-head with a decent hand against a possible blind stealer -- before my stack was blinded into oblivion. On the other hand, the small blind was a woman who, though I had only sat down at the table five or six hands earlier, was someone I was pretty sure would not have gone all-in without a pretty good hand. And, more than that, I hate to be the caller in that kind of situation -- that is to say, a horse race where it's about 50-50 who will win the hand and get to keep playing. It's much better to be the one who makes the raise, since then you have two ways to win -- showing down the superior hand, or having the other player fold. If you are the caller, you can only win by showing down the best hand. However, beggars can't be choosers. So, after agonizing over what to do for about three minutes -- an eternity in hold 'em -- I called. She turned over the A-K, five meaningless non-face cards showed up on the board, and it was sayonara, baby for yours truly. That night, I had trouble sleeping as I thought about the hand for hours, and rethought it, and rethought it, and RETHOUGHT it. The next day, trying to maneuver on about three hours sleep, I ran into Jim McManus in the press room. McManus is the author of "Positively Fifth Street," one of the two great poker books ever written (along with A. Alvarez's "The Biggest Game in Town"), the book which inspired my own current Don Quixote-like journey away from economic solvency and toward divorce. I asked McManus what he would have done with my hand. He quickly asked me one question: "How many seats were they giving out?" And when I said, "43 or so," he said, in a nanosecond, "Call." Now, you can say this is a confirmation of my growth as a player, since I made the "right" decision, even though it ended badly. I prefer to see it as a confirmation of how far down the bottom of the hill I still live, since I spent a few minutes trying to figure it out -- not to mention a night worrying about -- and McManus, (who is only an author, for Chrissake!) came up with the same answer in less time than it took Lyle Lovett to say "yes" to Julia Roberts. Later, to put the cherry on top of my perfect ice cream sundae of a day, I was knocked out of the media charity no-limit event by someone who wasn't sure whether a straight beat two of a kind. By coincidence, I had K-Q again and he had an A-x. For historians, the flop came K-x-x, giving me a short-lived smidgeon of hope. The turn, however, was an ace and, as I walked forlornly away, I heard World Series of Poker media director Nolan Dalla announce, "And Jay Lovinger of ESPN just busted out." Oh, Nolan, you Judas. Did I mention that the Vegas singer Clint Holmes, either Penn or Teller (I can never tell those two apart), a couple of Elvis imitators and the lawyer for Bob Varkonyi (winner of the 2002 WSOP) were among the "media" contestants? No wonder nobody trusts the media anymore. Day 15: minus $700; Day 16: plus $360; Day 17: DNP; Day 18: minus $1,725; Day 19: DNP; Day 20: minus $1,700; Day 21: plus $2,455; Day 22: minus $1,800; Day 23: minus $935; Day 24: minus $2,060. Jay Lovinger, a former managing editor of Life and a founding editor of Page 2, is writing on his poker adventures for ESPN.com and also writing a book for HarperCollins. You can watch the 2004 World Series of Poker starting July 6 at 9 p.m. ET on ESPN.